Stern's The Munsters Pinball machine celebrates the iconic American TV sitcom, The Munsters. Featuring popular characters like Herman, Lily, Raven, Grandpa, Eddie, Marilyn, Kitty, Igor and Spot, players are sure to enjoy their visit to the Munsters family. With multiball action, custom sculpted bash toys and a magnetized ball catch, players will be drawn in and wanting more. The pinball machine displays beautiful and distinctive hand-drawn artwork by Christopher Franchi, and the metal turn-around, flip-up ramp is sure to keep players on their toes. There are only 600 units made globally of the Limited Edition model. 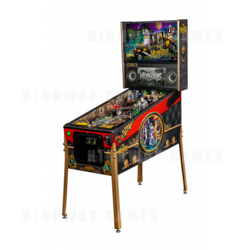 This model includes exclusive mirrored backglass, anti-reflection pinball glass, a shaker motor, exclusive custom art blades, a custom autographed bottom arch, a sequentially numbered plaque, and an exclusive custom casket-themed cabinet artwork.